A large black knife and three bats were found by police following the alleged stabbing of Wayne Heys in Carisbrooke Drive in Durrington on February 20, 2018. The weapons were shown to the jury at Hove Crown Court today. However jurors were told they have not been forensically linked to the alleged incident. Callum Alex-Hunt, 24, of Butts Road, Southwick, Joshua Bosley, 24, of Bulkington Avenue, West Tarring, Billy Howlett, 26, of Kingsland Close, Shoreham, and Katherine Olive, 20, of Harrow Road, West Worthing, are charged with conspiracy to commit grievous bodily harm with intent. All defendants deny the charges. Reading from the list of agreed facts, prosecutor Gabby Hendy told the court: “Following the arrest of Tommy Howlett on February 25, the address in Harvey Court, Littlehampton where he had been found was searched. “PC Johnston seized a large black knife with a black blade and black handle. The knife – safely stored in a clear plastic tube – was passed to the jury to look at. Ms Hendy told the court that the knife had been forensically examined and said ‘there was no evidence to link it to the attack on Wayne Heys’. She added: “A very low level and incomplete DNA result was obtained from the sample taken from the blade. The jury was also shown two silver baseball bats – one of which was made of metal – that Ms Hendy said were found in a cupboard at the Harvey Court address where Tommy Howlett was arrested. 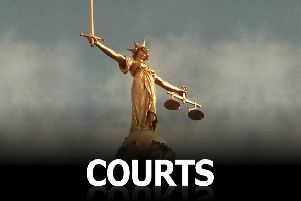 A wooden black bat was found in the bedroom of Bradley Allen’s address in Orkney Court in Durrington, the court heard. This too was shown to the jury. The prosecutor continued: “The DNA of at least three people was found on the striking ends of the silver metal baseball bats. The prosecution has now finished calling witnesses. The trial continues.